DENVER — The debate over ride-hailing firm Uber is laying bare divides in the Democratic Party and on the left about how to handle the new “sharing” economy. Republicans are hungry to exploit that ambivalence and make inroads into a wealthy sector of the tech industry. In New York City this past week, liberal Mayor Bill de Blasio tried to limit the number of Uber drivers on the streets, only to be rebuked by the state’s more centrist governor, Andrew Cuomo. The mayor’s administration decided to allow Uber to expand in the city for another year. That followed a pledge by the party’s presidential front-runner, Hillary Rodham Clinton, to “crack down” on companies that classify workers as contractors rather than employees, as critics contend Uber and other companies often do. Clinton did not identify Uber, whose lobbying operation is run by former Obama campaign manager David Plouffe and stocked with Democratic operatives. 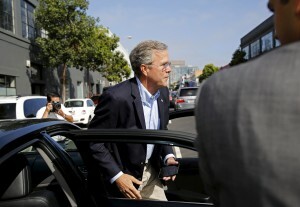 But her allusion led Jeb Bush, a Republican technophile who says he prefers his Apple watch to apple pie, to ride in an Uber vehicle during a campaign stop in San Francisco days later. For years, Republicans have struggled to gain support in the technology industry, an effort hobbled by in part by their stance on social issues and net neutrality, which is the idea that Internet service providers should not manipulate, slow or block data moving across their networks. But the bright-blue precincts of Silicon Valley have become a regular stop on the GOP circuit. Liberals have increasingly questioned the impact of the industry during a time of scarce jobs and wage stagnation. Former Treasury Secretary Larry Summers has noted that Apple employs a far smaller share of people than companies of its size did in the past. Silicon Valley and the surrounding Bay Area have become a symbol of the income inequality that Democrats bemoan. But it is the recent, explosive growth of Uber and other “sharing economy” companies that have attracted the most concern. HomeJoy recently announced it would shut down in the face of four lawsuits alleging it should treat the people who clean homes on its behalf as employees rather than as independent contractors not entitled to the same workplace protections. Lyft, Uber or the grocery delivery service Instacart and others rely on independent contractors to provide services for a fee: driving, house cleaning, grocery shopping and the like. Uber takes a commission from fees charged to its riders. The drivers, who can work as many or as few hours as they would like, get the rest. Many Uber drivers work part time to supplement their income, while others rely on it entirely. Founded in 2009, it was operating in more than 250 cities and 21 countries by the end of last year. Such innovations have hit core Democratic constituencies. Among them are taxi companies that give generously to urban politicians such as de Blasio, and professors worried about the proliferation of online higher educational courses. Larry Gerston, political science professor emeritus at San Jose State, said the Uber skirmishes will have limited impact in Silicon Valley, which is far more concerned with federal policy on matters such as patent protection. But Julie Samuels, executive director of Engine, a nonprofit that tries to connect startups with policy debates, said the tone of the debate is worrisome. “When any policymaker starts to ostracize the tech community, they’re ostracizing people who can make things better,” she said.